Updated!! Super Camera is now v2.1!! Stable as ever on iOS4!! 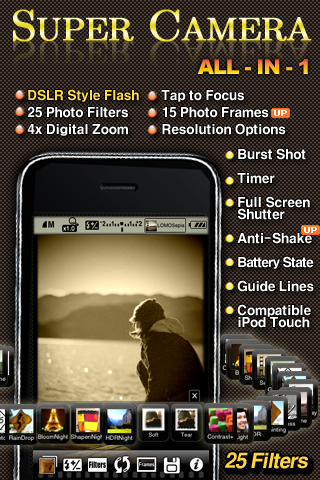 How many camera apps do you have on your iPhone? One? Tow? Three? Even more? Now only ONE will be enough. Super Camera will cover everything you need and more than all your cameras have done. Thumbnail View: 'Load' button shows thumbnail of what you've just taken or saved. Natural Gray: adapted for human eyes' color sensitivity. Rain Drops: Unique filter only for Super Camera. 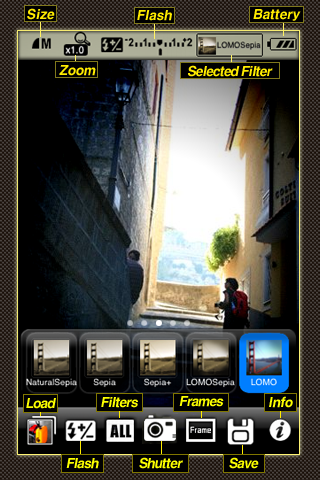 Lomo (Vignetting): reduces light at the edge. HDR: allows greater dynamic range of illuminance. Bloom: makes glow effect on bright objects. 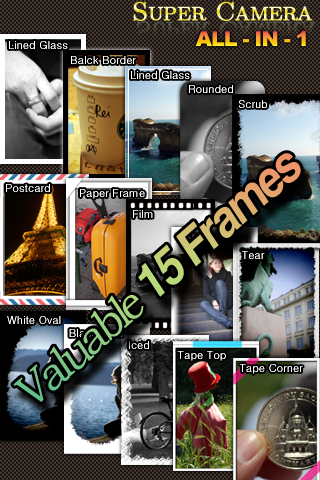 Sharpen: enhances detail and makes images more sharp. Lined Glass: Semi-transparent glass border with white line. Rough: brushes the edge with rough black. Since you don't have camera function on your device you can only open your saved photos rather than take a photo and auto-save it. 3 burst shots saved with no filter, no frame and no resolution option for faster processing. You can load the images from photo library and apply filter or frame on them. 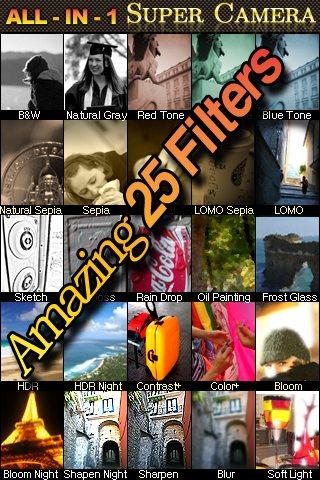 Tap again the selected filter/frame in Filter/Frame Menu. Tap bottom area on screen. TRY FREE VERSION! Super Camera Free! !